“Manage the Care: … the decisions, tasks, and workflows crucial to optimizing patient care must be the organization’s primary focus.” A CHARTSaaS RA-compliant IT solution will enable healthcare provider SMEs with minimal cost and complexity (i.e. — no software coding expertise and only minimal IT staff assistance required) to design, develop and deploy decision-based process applications a.k.a. “apps” that operate continuously, are automatically archived by version. Therefore, that will facilitate continuous process improvement (CPI) generally and also specifically The Joint Commission’s registered trademarked methodology named Robust Process Improvement a.k.a. “RPI” (http://www.centerfortransforminghealthcare.org/about/rpi.aspx). “Corral Variability: High- and low-variability care must be separated.” A CHARTSaaS RA-compliant IT solution will enable healthcare provider SMEs with minimal cost and complexity (i.e. — no software coding expertise and only minimal IT staff assistance required) to design, develop and deploy a decision-based process application a.k.a. “app” to implement the “iterative care process” described in detail by Bohmer in his book cited above — a repetitive cycling of a condensed scientific process intended to identify/define and then to treat a pathology that is not well-understood such as new forms of cancer — and also the “sequential care process” described by Bohmer — a prescriptive process to diagnose and treat a well-understood pathology such as Type II diabetes. “Reorganize Resources: … when delivery organizations redesign clinical processes, they must also reconfigure the supporting infrastructure and practices.” — A CHARTSaaS RA-compliant IT solution will enable healthcare provider SMEs with minimal cost and complexity (i.e. — no software coding expertise and only minimal IT staff assistance required) to design, develop and deploy a decision-based process application a.k.a. “app” for each pathology that is well-understood (i.e. — a sequential care process that implements the standard of care or best practice for care and treatment of the target pathology) and also for each new/little-understood pathology that is encountered (i.e. — an iterative care process that accommodates variability and user choices). 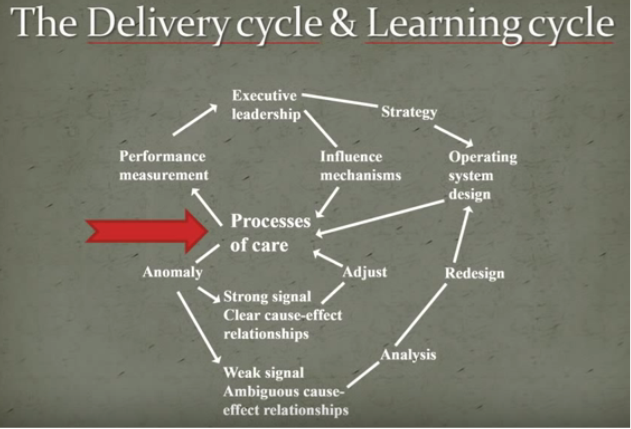 The optimal design of the iterative care process, including decision-making and analytics and interim data storage, will enable dynamic modification of its included activities/tasks to minimize variability over time; and, thereby, to approximate the design of a sequential care process. “Learn from Everyday Care: … the structure and processes of hospitals, clinics, and practices must designed to help organizations systematically learn from their daily work.” — A CHARTSaaS RA-compliant IT solution enables healthcare provider subject matter experts (SMEs) with minimal cost and complexity (i.e. — no software coding expertise and only minimal IT staff assistance required) to design, develop and deploy decision-based process applications a.k.a. “apps” that are archived automatically by version and thereby that provide a manually and/or automatically accessible archive of digital artifacts that embody not only static medical/healthcare and to progress the iterative care process toward a sequential care process. Healthcare providers will benefit significantly from understanding and appreciating Dr. Bohmer’s farsighted recommendations, and then from realizing them cost-effectively using a CHARTSaaS RA-compatible IT solution. To do so will mitigate medical mistakes (currently the third leading cause of patient deaths per Makaray and Daniel, http://www.bmj.com/content/353/bmj.i2139), thereby will minimize patient adverse events, and will optimize clinical case outcomes while maximizing cost-effectiveness of care and treatment delivery.